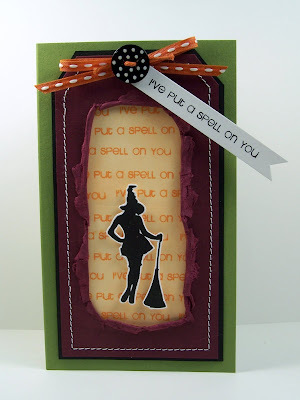 Have you checked out the newly released Bewitched set from Clear and Simple Stamps? Well how about a couple samples with this sassy set. For this card I started with a shipping tag and sponged the tag with Dried Marigold Distress Ink then stamped the words in Spiced Marmalade to create the background. Next I sewed the burgundy and black tag layers together then flipped it over and removed the middle portion of the black layer (just inside the stitching). Next I made a cut in the center of the burgundy layer and sprayed that layer with water so I could tear it and roll it back. Once the burgundy layer was dry I layered it over the shipping tag exposing just the center of the shipping tag throught the torn burgundy layer. All of the layers were mounted on a card base of Always Artichoke. Here's just a very simple card using Papertrey Kraft for it's base and a layer of Polka Dot Parade also from Papertrey. 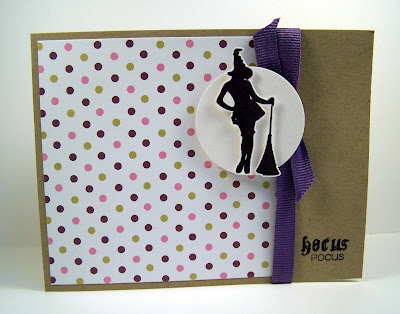 I tied some purple grosgrain ribbon around the card and added the circle with the cute little witch mounted on it. The words and witch were stamped with SU Elegant Eggplant. 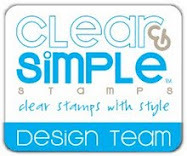 Now on a more personal note I just wanted to share this adorable banner that the folks at Clear and Simple Stamps posted for me. I have the honor of meeting them in person tomorrow when we attend the Copic Certification Class in Minneapolis. What a great way to celebrate my birthday! Thanks so much for stopping by. I hope you're all having a great day! Happy Stamping. I love both the cards, especially the first one with the torn edges. You will have so much fun with CSS, I'm envious of the Copic cert class, keep on hoping they will have one near here. Have fun and Happy Birthday!!! Happy Birthday, Beth. Gosh I'm envious of both the Copic class and meeting CSS people. You'll have a great time. What fabulous cards, Beth! Love how you showed off the silhouette images from this set. Enjoy the Copics class and your time with Nicki and Reenee.